I absolutely loved this short story, I couldn't put it down. The plot was different, the writing style is what has made me a Dahlia Donovan fan, but the characters are again perfect. Gorgeous men loving their significant other hard after falling fast. 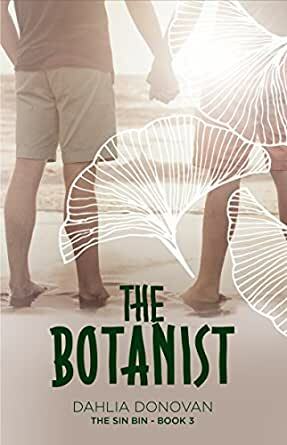 'The Botanist' can be read as a standalone but this series to too good to not read them all, I can't wait for the next book, Hamish's story. Wyatt (a Seal) first meets Aled (a student Botanist) when he rescues him from being tortured by drug barons. Wyatt and his friend Hamish look up Aled, 6 months later, when they both leave the military, they find him suffering extreme PTSD. What started as support from Wyatt grows slowly and patiently into true love. 5.0 out of 5 starsPatience Wins! Dahlia Donovan and Hot Tree Publishing bring us a beautiful love story, a short story, involving an unlikely cast of characters. @DahliaDonovan, Exquisite once again! Published 8/26/17. Navy SEALS are on a training exercise with their British counterparts when they identify a small boat in their designated combat zone, an area where there should be no boat. Wyatt, SEAL team leader has been thinking about leaving the Navy and time to move on to other parts of his life, partially due to DADT restrictions. When his ‘spidey’ sense tingled as they drew closer to the out-of-place boat, he had no way to know that this would change his life forever. Young botanist Aled, on sabbatical from his studies, has been kidnapped and tortured by sea pirates who mistakenly believe he is their drug mule. His physical and emotional scars from the terrible events of his torture and resulting PTSD combine to make him a captive in his own home. This story is wonderfully written, perfectly paced and deals with a relationship at its most intimate level without sexual intimacy! I don’t remember a more beautiful love story involving the basic themes of hurt and recovery or a more patiently developed relationship. Wyatt’s overwhelming feeling is that Aled is “his botanist” no matter how long it takes, how many years, and that of “good fortune that no one else ever realized how amazing Aled is before they met”. I do recommend reading all of the Sin Bin Series, in the proper order, so that you can fully appreciate these interesting men, an international and diverse cast of characters! My only lament about this story is it felt so short. But hey, I am not the author nor really creative at all. But it is her fault that I fell in love with Aled and Wyatt. I am hoping we see them more in The Royal Marine, Dahlia Donovan's next book. This very quick story tells the tale of Aled, a botanist student who is tormented by drug runners due to mistaken identity. Wyatt is part of the team that rescues Aled, though Aled suffers terribly from PTSD and actually needs months and months of 'rescue.' Wyatt is an infinitely patient man, being a friend above all else. This is a love story that unfolds over months and years. As they grow closer, they grow funnier with each other (so funny!) but the barrier to physical love takes much longer to fall. If you have not read any of these books, I highly recommend them. They can all be read as stand-alones but so much better when read in order. They are all very different from each other, as well. The Botanist dealt with an issue too many people have to suffer:PTSD. I was glad to see Aled didn't "heal overnight" as too many characters often seem to do in some stories. Instead with Wyatt's help he gradually returns to feeling he can live again. Can't wait for the next story about Hamish and Scotty! I do enjoy Dahlia’s stories and this one introduces Wyatt, who works for Hamish, and Aled, the botanist. It was a rather long timeline for a novella and a rather heavy subject, showing glimpses of Aled’s slow recovery from PTSD. It’s written well, using time jumps to take the couple forward in time to a sweet, happy ending. Would have made a good novel. 5.0 out of 5 starsPatience was the key to Alad's recovery. A story filled with lots of emotion, heart, and tenderness. Wyatt just knew that slow and easy was the only way he could go to in order to aid Aled in his survival from the traumatic and horrific events that he had endured. Wyatt was totally on board with his desires & instincts to help Aled succeed; a very satisfying story in this series. After all he was a former Seal and success was all that he knew.